These words are printed on a white wall in the Copper House Gallery in Dublin where I went to see the exhibition “BEYOND – Irish Outsider Art”. It is a powerful exhibition which I highly recommend to visit next in Cork, The Atrium, City Hall from 17th November to 4th December. Untitled by Paul Maguire – from the BEYOND exhibition. But what is Outsider Art? In the context of this particular exhibition it refers to the work of artists generally self-taught, who work often alone in psychiatric hospitals and prisons, or suffering social exclusion. Over the years however the term has been used increasingly loosely and can often refer to the work of any artist who have little contact with the mainstream art world, who doesn’t necessarily exhibit or have interest in selling their art. The people I work with don’t always see themselves as ‘artist’ or find quite difficult to recognize themselves as such and yet that’s what they are. As each person engages with art the curiosity needed to go into something new develops and the wish to explore and observe develops too. Then through painting or drawing each artist translates their particular, personal experience into something original that did not exist before. It is a wonderful act of transformation that requires time, trust and faith. 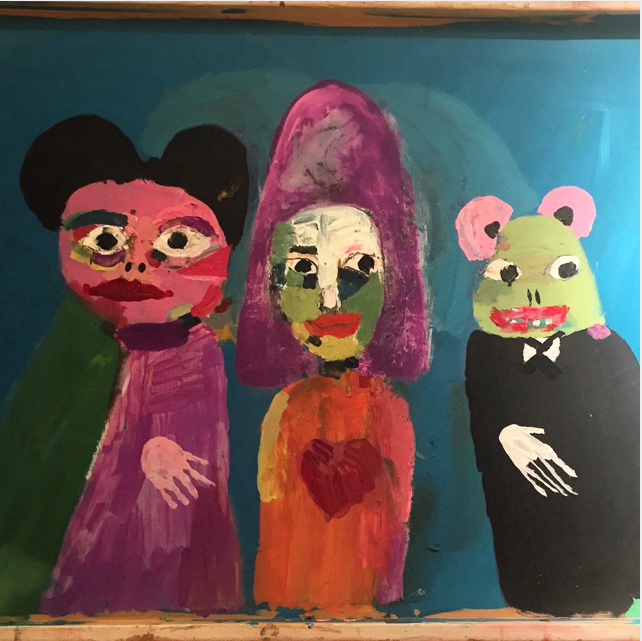 ‘outsider artists’ with aspirations that includes allowing themselves the freedom to play, to discover and to appreciate each other’s unique artistic style and learning to accept it and make the most of it. moments of chaos. We admire the next person’s work while deploring our own, only to discover at the following class that our own work wasn’t that bad after all! True, some groups are a bit more special than others and may present specific challenges because they live on the margin of society. These are also the groups where true new learning occurs, learning that I can bring back into my wider world so that all together we can grow from there. As an artist I am a bit of an outsider too, by choice that is. I like playing too much to take myself and the official art world too seriously. Yet I am very serious where my art and my students’ art is concerned. The wealth of imagery that surfaces during art-making carries too much profound meaning to be taken lightly. Art-making is serious work, like play is for the child. We really need to devote to it the same caring the child takes during play. “If you take care of your art, your art takes care of you.” I heard a musician say on the radio a few nights ago. Makes sense, doesn’t it?